The JavaFX 2.0 package javafx.scene.shape contains useful classes for drawing shapes in JavaFX. Given that today is Christmas Eve, it seems apropos to demonstrate some of the package's classes that can be used to draw a Christmas tree. In my example for this post, I make heavy use of JavaFX 2.0's javafx.scene.shape.Path class, but I could have used javafx.scene.shape.Polyline, javafx.scene.shape.Polygon, or javafx.scene.shape.SVGPath to accomplish the same thing (and in arguably easier fashion). Because I use the Path approach, I also make heavy use of javafx.scene.shape.LineTo and javafx.scene.shape.MoveTo. I use the path approach to build the outline of the main portion of the tree and then again to build the outline of the stump. The main part of the tree is filled with green fill color and the stump similarly is filled with brown fill color. 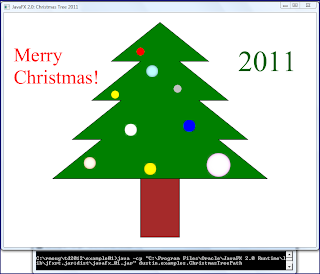 The bulbs of the Christmas tree are circles created using JavaFX 2.0's javafx.scene.shape.Circle class. A MouseEvent handler is placed on each bulb such that clicking on a bulb leads to it increasing in size and showing the glow effect. 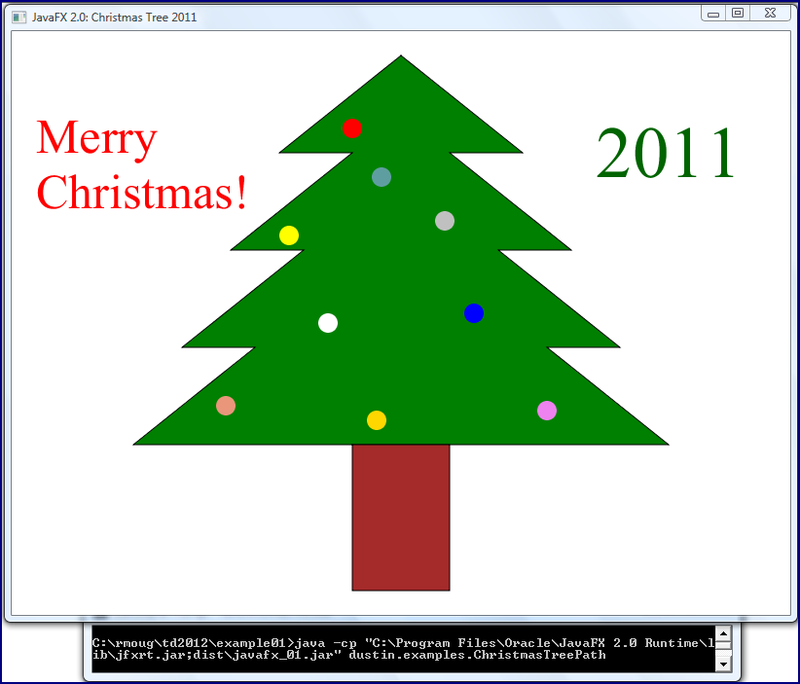 There is also some text added to the Christmas tree that makes use of the JavaFX 2.0 text APIs I discussed in my previous post Simple JavaFX 2.0 Text Example. The code listing for ChristmasTreePath.java is shown next. * Simple example of using JavaFX 2.0's Path to create a simple Christmas tree. * Simple representation of (x, y) coordinate. * Create instance of me with 'x' and 'y' components. * @param newX The horizontal portion of the coordinate. * @param newY The vertical portion of the coordinate. * Provide String representation of this coordinate. * @return String representation of this coordinate in form "(x, y)". * @param centerX X-coordinate of center of bulb. * @param centerY Y-coordinate of center of bulb. * @param radius Radius of bulb. * @param paint Paint/color instance to be used for bulb. * @return Christmas tree bulb with interactive support. * Add colored circles (bulbs) to the provided Group. * @param group Group to which 'bulbs' are to be added. * Add text portions to Christmas Tree group. * @param group Group for text to be added to. * Starting method of JavaFX application. * @throws Exception Thrown for exceptional circumstances. * Main function that kicks off this JavaFX demonstrative application. This is no masterpiece, but the finished result is shown in the next two screen snapshots. The first image shows the application when it starts and the second image shows it after a few bulbs have been clicked on. I clicked on the bottom right bulb several times to make it much larger. This blog post has demonstrated simple use of some of the classes in the javafx.scene.shape package. My drawing skills leaves something to be desired, but the example does illustrate use of these JavaFX 2.0 APIs. Although I did not show it here, use of SVGPath could be valuable for generating shapes generated with a tool like Inkscape. The blog post Merry Christmas features a Christmas tree drawn with ASCII art using Scala. The blog post JavaFX 2 Custom Shapes provides another example of using JavaFX custom shapes.